A team of undergraduate students have produced a podcast series about the experiences of Jewish people at UCL. In creating this valuable resource for personal tutors and the broader UCL community, the project also developed the research skills of the students and gave valuable insights to the teaching fellow who instigated it. 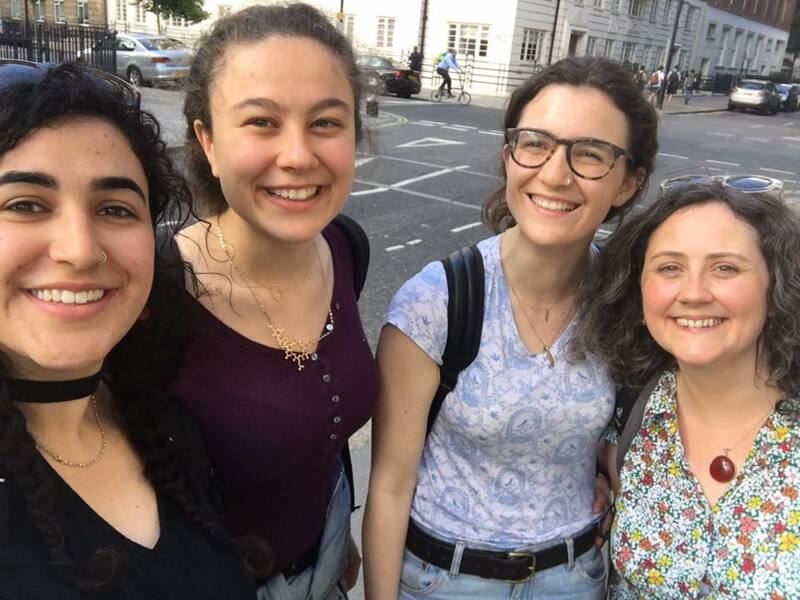 Laura Katan, Sarai Keestra, Manya Eversley worked with Cathy Elliott, Senior Teaching Fellow in UCL Political Science, to find out more about experiences of being Jewish at UCL, in the context of a significant increase in anti-Semitic hate crime in the UK between 2010 and 2015. The project received a small Liberating the Curriculum grant from the UCL Arena Centre for Research-based Education. students connecting with each other, across phases. the teaching method was so intertwined with the learning and doing process – it was a very successful way of teaching. it’s the teacher’s responsibility to empower the students – we’ve found this project to be incredibly empowering. we actually got the opportunity to get practical experience of research – you learn so much more. in interpretivist research, stories are co-created. The idea is to be reflexive, where you learn as much about yourself as you do about your interviewee. they can be messy – a podcast can’t be perfect – with clumsy phrasing in interviews, controversial exchange of views and so on. It is a challenge to accept these flaws. now we are sending out our podcast in the world and I am looking forward to hearing the responses and criticisms. It ain’t over yet! it’s a real skill to listen to someone and at the same time to think of a further question. avoid jeopardising the quality of the interview by not allowing your own opinions to come to the fore. initially I was quite skeptical about the use of interviews to gain data. Trained as a scientist I didn’t see how talking to people for an hour in a relatively unstructured interview would lead us to anything tangible that we could call results. Turns out I was completely wrong. …the skills I learned are definitely going to help me in the future. I am talking to someone at LSHTM about joining a research project on antimicrobial resistance [using] interviews with ‘normal citizens’ to understand the ideas and beliefs people have surrounding antibiotics. My interviewer was very impressed and enthusiastic that I had done research using qualitative methods before. Furthermore I think the listening skills I got from this project will be very important for my future career as I am considering pursuing a career in medicine in which properly listening to a patient is vital on the road to recovery from illness. In Episode 5: What I Wish My Teacher Wouldn't Do, the team talks about some of the things Jewish students wish their teachers wouldn't do and why most teachers will never get to hear about it. In Episode 7: The Jewcy Bits, the team talks about the research approach. This is how I imagined university to be – different from school where you just read and do. This project has given me a whole new lease of life. It’s taken a lot of my time but its felt like fun and not like work. I found it super interesting, the massive diversity of Jews and Judaism and the different ways of being Jewish, that’s what I’ve enjoyed the most.